What Is myvitamins Beauty Collagen Powder? 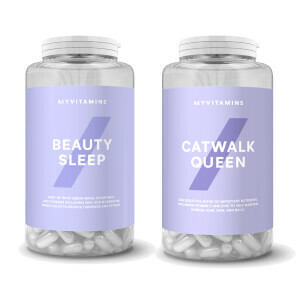 myvitamins Beauty Collagen Powder is a delicious source of type I and III Collagen, which comes in four refreshing flavours, including Fruit Sherbet, Cola Cube, Peach Hearts, and Tropical Crushin’. Why Use A Flavoured Collagen Drink? Our hydrolysed collagen has been expertly formulated into a delicious powder that can be added to water, smoothies and other recipes to provide a tasty boost. Each serving contains at least 8g of collagen! What Works Well With Beauty Collagen Powder? The myvitamins Beauty Collagen Powder is a unique addition to our beauty range. Collagen is also available in capsules, unflavoured powder, and a multivitamin. Add 1 scoop (10g) to 600ml - 700ml of water (to preferred taste), mix, and consume once a day at a time convenient for you. INGREDIENTS: Hydrolysed Collagen Powder (Bovine Hides) (85%), Flavouring (Natural Flavouring, Flavouring, Acid (Sodium Citrate), Sweetener (Sucralose, Acesulfame K), Colour (Sunset Yellow, Allura Red, Brilliant Blue)), Acid (Citric Acid), Vitamin B Complex (Niacin, Pantothenic Acid, Riboflavin, Vitamin B6, Thiamin, Folic Acid, Biotin, Vitamin B12) (5%), Vitamin C Powder (0.2%). ALLERGENS: Produced in a facility which also handles milk. Contains Sunset Yellow and Allura Red which may have an adverse effect on activity and attention in children. SUGGESTED USE: Add 1 scoop (10g) to 600ml - 700ml of water (to preferred taste), mix, and consume once a day at a time convenient for you. INGREDIENTS: Hydrolysed Collagen Powder (Bovine Hides) (86%), Flavouring (Natural Flavouring, Flavouring, Acid (Citric Acid, Malic Acid), Sweetener (Sucralose, Acesulfame K), Salt, Colour (Sunset Yellow)), Vitamin B Complex (Niacin, Pantothenic Acid, Riboflavin, Vitamin B6, Thiamin, Folic Acid, Biotin, Vitamin B12) (5%), Vitamin C Powder (0.2%). Contains Sunset Yellow which may have an adverse effect on activity and attention in children. 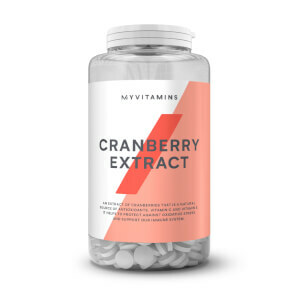 INGREDIENTS: Hydrolysed Collagen Powder (Bovine Hides) (87%), Flavouring (Natural Flavouring, Flavouring, Acid, Sweetener (Sucralose, Acesulfame K), Citric Acid, Malic Acid, Salt, Maltodextrin, Colour (Allura Red)), Vitamin B Complex (Niacin, Pantothenic Acid, Riboflavin, Vitamin B6, Thiamin, Folic Acid, Biotin, Vitamin B12) (5%), Vitamin C Powder (0.2%). Contains Allura Red which may have an adverse effect on activity and attention in children. ALLERGENS: Produced in a facility which also handles milk. Contains Allura Red which may have an adverse effect on activity and attention in children. INGREDIENTS: Hydrolysed Collagen Powder (Bovine Hides) (82%), Flavouring (Flavourings, Acid (Citric Acid), Sweetener (Sucralose)), Colour (Beta Carotene), Vitamin B Complex (Niacin, Pantothenic Acid, Riboflavin, Vitamin B6, Thiamin, Folic Acid, Biotin, Vitamin B12) (5%), Vitamin C Powder (0.2%). The nutritional information is based on the Cola flavour, when choosing an alternative flavour the nutritional values may vary. The best thing I have bought! 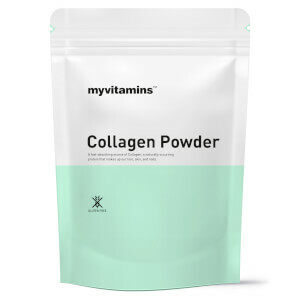 I was lucky enough to be included in a pre-release email from myvitamins for their brand new Collagen Powder. I am a big fan of their Coconut & Collagen tablets so thought I would give their new product a go and I am so glad I did - new favourite! I was torn for choice with the flavours but I finally decided on their Tropical Crushin' flavour as I thought it was the perfect summer vibe and let me say it smells and tastes delicious. It has replaced my morning orange juice. I have been taking the beauty collagen powder for around 2 weeks and my hair has become shinier and my nails seem stronger. I honestly cannot wait for the next few weeks and see what other results I get. 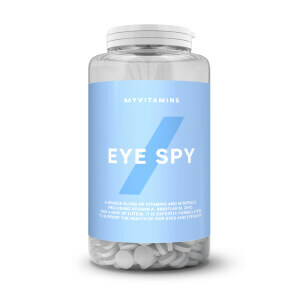 I was lucky enough to receive the pre-release email of MyVitamins Collagen Powder a month ago. I was sceptical about purchasing a first but after reading up about the benefits of Collagen Powder i thought i'd give it a go. I can honestly say that i'm never looking back. The redness of my skin has significantly reduced, I've noticed I'm less prone to breakouts (especially in areas around my chin and nose) and I've started to recently notice my skin looks more radiant and hydrated. This has now become a staple part of my beauty routine...and what's more, the flavours are delicious and it's helped up my water intake as I struggle to drink enough water throughout the day. My favourite flavour is Cola Cube...if you like flat coke, you'll love this! Just repurchased for this flavour and the Tropical Crushin'. Can't wait to see the continued results.